Wirquin is a family group with an international mission. 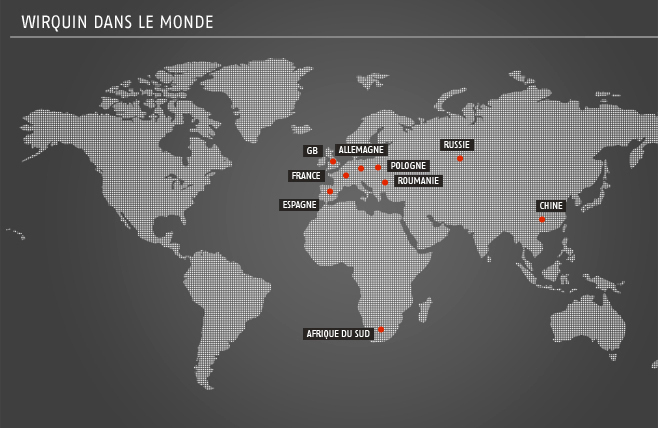 With 10 subsidiaries (UK, South Africa, China, Spain, France, Portugal, Romania and Russia), including 6 production sites. Wirquin is continually striving to provide the best products and services to its clients all over the world. There are more than 70 sales representatives working in over 60 different countries, making 300 customer visits and 600 phone contacts each year. The Group has more than 1335 employees. Over the years, the innovative product range has widened to include sanitary equipment for the whole house and business. The UK's largest range of seats including thermoset, thermoplastic and mouldwood with a variety of hinge types, some of which have set British Standards. The range includes bath, shower, sink, basin and urinal wastes that provide innovative solutions and installer flexibility. The extensive range includes valves and siphons that fit a variety of cisterns and appliances, many of which are WRAS approved. The complete range of exposed and concealed cisterns for all applications on the market. The extensive range of in-wall frames, from modular and pre-assembled to standard solutions for quick and easy installation. The range of flexible and extendable WC pan connectors and pipe connectors are reliable and quick to install. The brand dedicated to DIY stores. The brand dedicated to the French professional market. The well known British brand, founded in 1890, for toilet seats for professionals and home-owners. The British brand incorporating a range of flushing mechanisms, cisterns, frames, traps, wastes and connectors for professionals and home-owners. The brand providing a range of drainage systems and fittings on the Russian market.